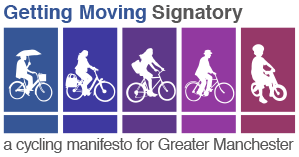 One of 30 signatory organisations, we support the campaign by providing volunteers with a bike travel allowance which is equal to that of their public transport costs. Many companies provide travel allowances for vehicle fuel receipts, or for ticketed travel on buses, trams and trains. However, when individuals choose to cycle, they can often end up out-of-pocket by the simple fact that they don’t have a physical bill to claim against. That being said, for all its benefits, cycling does incur costs. Firstly, there is the initial purchase of the bike and safety gear (if not already owned). Then there are extras that need to be considered such as panniers to bring in what’s needed for the day’s work, and maybe a mud-guard to protect clothes from splatter. The bike also needs to be maintained – oil for the chains, puncture kits and repairs for the tyres, even a full bike check after a close-call with a pothole! We provide the bike travel allowance as it encourages volunteers to use an active, lower-carbon mode of transport when compared to driving, or public transport.